Hi ladies!! Just squeezing in my last post for 2011 to show you my New Years Eve manicure. It's a fail! I had no idea what I wanted and ended up doing a whole load of different things that didn't work. But hey, you see the good and the bad on my blog! 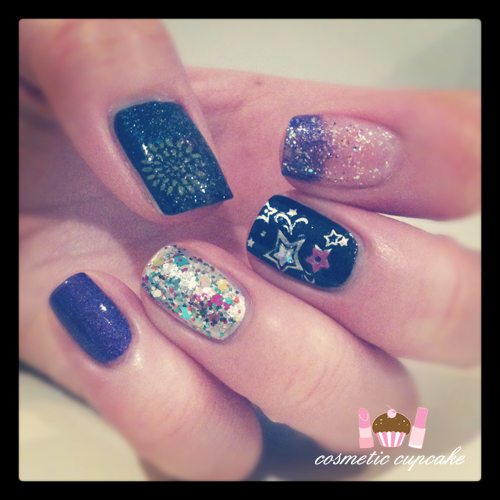 I recall my New Years Eve mani last year was a fail too ho hum.. curse of New Year perhaps??!! Thumb: I used 2 coats of Face of Australia Iron Ore* and stamped firework looking design from Bundle Monster plate BM02 using Konad Special Polishes in yellow, purple, blue and pink. I topped it all off with a coat of China Glaze Fairy Dust! Index finger: I did a purple gradient using Teeez Outta Control on the top 1/3 and some sparse purple glitter on the top 2/3 and a clear glitter over the whole nail. Middle finger: I used 2 coats of Face of Australia Iron Ore* and stamped star image from Bundle Monster plate BM21 using China Glaze Millenium and added some star dazzlings. Ring finger: I used 2 coats of Face of Australia Titanium* and added 2 coats of OPI Rainbow Connection*. Pinky: I used 2 coats of the lovely Teeez Outta Control holo that Marte kindly sent me in our swap. * Products sent to me for consideration but this in no way influenced my review in any way. As always, my reviews are my 100% honest opinion. My Disclosure Policy can be viewed here. I really like this! So festive and sparkly. It's a gorgeous manicure, I wish I knew how to do it but I'm really bad at it! Why is this a fail? It looks pretty awesome to me! still looks cute ;) I forgot my mani haha! Those nails are so so festive! I love it :) Hope you're having a Happy New Year! 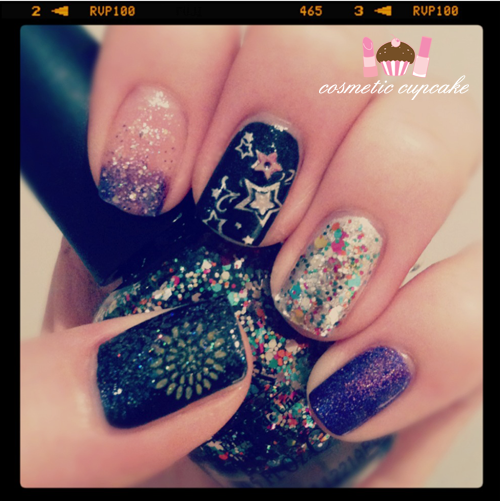 this is perfect mani for new years!! @Yolandaas: Thanks for your lovely comment hun =) I wish I liked it more, I couldn't wait to remove this mani! @Jeeya (De Frozen: thank you =) sometimes it does but for this mani I didn't think so! @HariRari: It just takes practise! Also helps to get inspiration from around you and stuff. I hope you had a wonderful New Year! @Tina: Lol thanks Tina! It's a fail because it didn't turn out how I wanted it to and it was just too random. I didn't think the mani through! @Ashylynn: <3 You're so sweet lovely! I hope you had a fabulous New Year Ashylynn! @Moni: Awwww you're too kind Moni! Lol I did this really last minute. Hence why it's so random haha. @Phoebe: Glad you like it Phoebe =) I had a lovely New Years thank you and I hope you had an awesome time too! @Jen: Oh seriously you're too nice Jen! This mani is a crazy collection of ideas to me haha.